Before purchasing, please check the minimum system requirements. The Volkswagen Eos: 2007-2009 Repair Manual on DVD-ROM is now available. 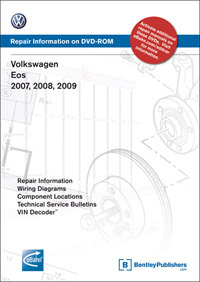 This is the DVD-ROM publication of repair information for the 1F platform Volkswagen Eos. This comprehensive repair manual contains the repair information provided by Volkswagen to their factory-trained technicians, making it an invaluable resource for the Volkswagen Eos (1F platform) owner. It provides clear & complete step-by-step procedures to help you understand, care for, and repair your 2007-2009 Volkswagen Eos. Wiring diagrams, component locations, and technical bulletins are also included in this manual. eBahn® Desktop repair manuals offer a convenient way to view a wide variety of technical automotive repair information on your PC. From repair procedures to Diagnostic Trouble Codes, eBahn® Desktop repair manuals enable its users to easily access service and repair information that vehicle manufacturers supply to their dealer technicians.